**Recommendations: Cowboy Eggs Benedict, anything with home made sausage and hash. The Everest Burger just because it’s a novelty and a slice of pie a la mode since it’s famous. Basically everything I ordered, but the burger and pie is not as mandatory as the benny. Will they cry when they hit bottom? Where the hell am I?!?! No, really where the hell am I Sherman? It was another dining adventure with Sherman and this time he decided to kidnap me to Langley. I’m not filthy rich or spoiled rotten, but I was a bit out of my comfort zone to say the very least. Don’t get me wrong, I love dining in the suburbs, but this was pretty damn far. This was deep in the neck of the woods kind of suburbs! I mean did you see the outside? It looks so… so… American. It’s probably a trip only obsessed foodies would make… so I guess we fit in that category. Nonetheless I was incredibly excited and thrilled even just from the outside. It was in the middle of nowhere and it screamed “local favourite” and “hidden gem”. We will travel for food and I love fine dining as much as I love hole in the wall dives! This is the definition of an old fashioned classic diner. I felt like I was in a movie. Actually Sherman told me that the Butterfly Effect was shot here too. It’s certainly movie set material and it didn’t even really feel real to me. I loved it! It wasn’t a modern and fancy downtown Vancouver diner, but a real truck driver, greasy spoon, Diners, Drive-Ins and Dives potential kind of diner. So what was the reason for coming? Well I am no “Mountain Man”, but with Sherman’s encouragement I kind of wanted to be… as long as I can keep my heels on. Actually we were aiming to be even bigger than the Mountain Men. We’re high achievers, so we wanted to be Everest Men. Okay, this is starting to sound weird. Yes, we’re in Langley, not in Thailand. So what is a Mountain Man and an Everest Man? Well the above photo shows the Hilltop Cafe Diner “Mountain Men & Everest Men Wall of Fame”. It’s a collage of photos of all their customers that have ordered their infamous “Mountain Burger” and “Everest Burger”. They are all champions and we wanted to be on there too! Hilltop Cafe Diner is most known for two things… well I guess three. The home made pies, the Mountain Burger and last, but not least… definitely not least… THE EVEREST BURGER. So what are these famous burger all about? Well here it is! And THIS is what we came to conquer! I was prepared because Sherman had warned me, but wait! What?! Doh! No egg? Boo! Or onion rings? Double boo! Argh… the Mountain burger actually sounded better to me, but this Everest Burger is what we came for, so there was no change of heart. Although my heart did not thank me for it afterward either. You think by now I’ve had my run of trying ridiculously massive burgers. Do you remember The Olympic Burger at The YEW at The Four Seasons? That one was huge! See my video here. Then there was also The Flatline Burger at Hog Shack Cook House – double burger patty sandwiched between two grilled cheese sandwiches. And now I have another one to add! I’m not even about huge portions and massive burgers because I tend to find them more of a novelty and it’s just not really my thing. I like to enjoy my food and the flavours, but big portions are fun and visually exciting! So I guess you could add this to your list of food that is worth seeing and at least trying once in your life. It’s even better when you have some determined company… who happens to take awesome photos too! Thanks Sherman. Regardless of the Mountain Burger or Everest Burger offered at the Hilltop Cafe Diner, this place is worth a trip. I thoroughly enjoyed the eggs benedict here, and yes, we ordered more than just the burger. But seriously, everything is made in house and it was solid home cooking. I would come back to try more of their breakfast items because this place is not just a novelty, even though a couple of their offerings might suggest it to be. The house made sausage is delicious here and that’s what makes this benny a must try. The hollandaise sauce was thick and creamy and good, but it didn’t really taste like a hollandaise either. It lacked a lemony tang and zing, and was honey-ish, but the whole thing together worked like a charm! The egg was perfectly poached creating a lovely waterfall of golden egg yolk. I want to add this photo to my Tribute to the Egg Yolk Series. It’s a regular toasted English muffin and the hollandaise sauce tasted almost like a melted mashed potato sauce mixed with a bit of Cheez Whiz. The hollandaise didn’t have a kick or tang, but it did have a floury mashed potato texture. It wasn’t curdled, but maybe the butter wasn’t clarified. It was good, but different. The pork patty was amazing! It was the star of the show. You could tell the patty was home made with ground pork and herbs, and it was so juicy, savoury and a bit sweet too. The meat was quite lean which was surprising that it was still so moist and juicy. It was cooked perfectly, and it may look a bit pink, but it was perfect. This is my photo, not as pretty, but the portions are generous and that hash is amazing. The hash was delicious! It tasted like a pile of my mom’s potato cakes! It was almost like crispy mashed potato cakes with onions mixed into it. They were Russet Kennebec potatoes and they were roughly mashed and very buttery. They were creamy, fluffy, moist, savoury, and even a bit sweet from the caramelized onions. Loved them! This is only available before lunch time at around 10:30am – 12pm, or non-peak hours, because it takes up the entire grill to make. It’s really cute because anyone who orders it gets their photo taken. Look for us on the “Everest Burger Wall of Fame” next time! This is the famous “Everest Burger” and it comes with a mountain of fries. It’s easily enough for 2-4 people. They were skin on Kennebec potato fries that were thin, crispy and decently seasoned. They tasted like fresh Hickory Sticks, and I liked them. Honestly there is no way you can actually enjoy eating this like a real burger, so you have to knife and fork it. I still managed to get a piece of everything and try it all in one bite though. The chewing is tiresome! It’s not actually that greasy, but just dry. The patties are dry and it’s really chewy with a lot of beef patty and it’s just too much. Of course it would be, but I just needed more cheese and sauce and something to moisten it up or balance it out. It was a regular beef patty and it didn’t have much flavour and I’d 100% prefer their home made sausage patties instead. That, would be a great burger! I’ll take a 4 sausage patty burger over this! My favourite part were the Farmer’s sausage (top layer), which was juicy and thick and it had a snappy casing. They were pan fried and it came with a lot. The baked ham (middle layer) was home made and it’s decent, but a bit tough. I think it’s maybe better in a benny, when there’s more sauce. I wasn’t a fan of the bacon which wasn’t crispy and much too fatty, and then I could barely taste any sauces. The Hilltop sauce seemed like relish mixed with mayo and a touch of Ketchup. It was pretty much that In-N-Out Burger Thousand Island dressing. The caramelized onions were nicely browned, but rushed, so still crunchy and not quite caramelized or that sweet yet. The sauteed mushrooms were appreciated. Basically it’s a novelty, which I knew coming in. It’s not my thing although it was fun and just really cool to witness. The Olympic Burger at The Yew was actually bigger and I liked the flavour of that one better, but that was a novelty too. They’re famous for pies so of course I had to get one… or two. It’s good for a diner style coconut cream pie, but I’m a bit picky on my coconut cream pies, so I found this okay to good. The crust was almost like a shortbread crust and it wasn’t sweet nor did it have coconut in it. I love when they make the crust with coconut too. The custard was pretty sweet and it tasted a bit artificial to me. It seemed like that Bird’s Custard Powder mix with some coconut mixed into it. I wasn’t really feeling that part, but I liked the incorporation of coconut. The top was pipped with whipped cream and I think it could have been store bought, but I’m not sure. It was no doubt a coconut cream pie and I got the coconut flavour and texture, but I wouldn’t care to go back for it like I would the benny. This one just seemed like a “short-cut” coconut cream pie, but it’s not bad. One of my favourite Coconut Cream Pies was at Dahlia Bakery in Seattle – see Tom’s Famous Triple Coconut Cream Pie. For +$1 a la mode you’d be stupid not to add it! And the ice cream is great here! I had to get a traditional fruit pie, although they had a sour cream and raisin one that I want to go back to try. Since they’re famous for pies I thought this would be amazing, but it was good. I wouldn’t make the drive for the pies alone, but I’d still order one and I’m curious to try their other flavours. The ice cream was amazing! It’s from Mountain Dairy in Abbotsford and it was good! There’s no actual vanilla bean in it and it’s not rich and creamy, but it’s really hard and not greasy. The flavour of vanilla was still strong and I loved it! The pie crust is super thin, soft and tender, but it’s not really crispy or flaky. When the crust flakes it flakes as thin layered sheets and not as crumbs. It’s a 4:1 filling to crust ratio. The pie filling was too gluey for me and it was too heavy on the corn starch. It was creamy and heavy on the rhubarb and the strawberries were likely Californian because they weren’t sweet. It was a tart creamy filling and I wanted more pieces of fruit to bite into because most of it was just the thickened gooey fruit juice compote. The pie does melt in your mouth and it requires little chewing, but I wouldn’t have guessed they were famous for them. They’re still worth trying and I could see if people like that sort of crust, but the filling really needed more fruit. Well like I said on someone *else’s* similar post, I’m sure Sir Edmund Hillary would have been proud of you guys ! My heart hurts lookin’ at that burger. Well, that Everest burger is ridiculously large…it’s up there with 7 Layer Chocolate cake, whew!!! Now the largest burger I ever ate was at the old Husky truckstop/gas bar a few miles outside of Hope; every burger was named after a truck manufacturer(Mack,Kenworth, etc.). I think I remember the Kenworth having 2 large beef patties, 2 cooked eggs, chili,tomato slices, pickles, onions, relish, mustard, cheese slices melted, fried mushrooms,etc….get the picture ? But it was on a plate, not stacked…Mijune, you didn’t actually eat it all, did ya?…I think that the burger required some chipotle mixed in the meat, each patty could have a chipotle mayo slather…and you had ROOM for pie ? @LotusRapper – you’ve actually been here?! Or from the pictures you love it!? Would you make the drive out? @Kevin – we had 1lb sandwiches after… my heart hurt. @LotusRapper – WOW! 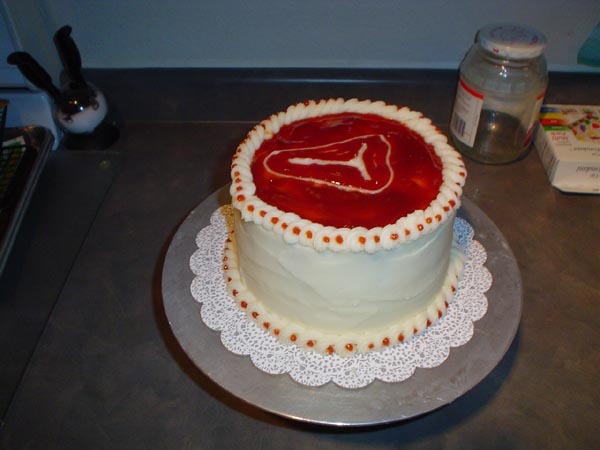 That actualyl looks like a REAL cake… but having it look like a cake would really throw me off. It certainly wouldn’t taste bad… but visual plays into enjoyment of food… so it would throw me off. I’m sure it tastes good! @Bow – mm mushroom gravy on that burger would have been great. @LotusRapper = Wow! Amazing! I would have never guessed! Very cool! Hey guys. Thanks for coming by the Diner. A big thanks also for the comments. My Mom, Aunt and I have only been at the diner for a little user four months now and we are really really enjoying ourselves. Just wanted to let you in on a few secrets. We use kennenbec potatoes for our fries and hashbrowns and the ice cream is local, from mountain dairy in Abbotsford. I am very glad you guys enjoyed your experience and I hope you come back again soon. We have a lot of food ideas up our sleeves. @HilltopCafeCook (Kris) – Hi Kris!! Thanks so much for the comment and corrections! I thought the ice cream was different!! I ended up asking our server though and she said it was GFS so it knocked my socks off… thanks for telling me though! I’ll change that in my post and I’ll edit the Russet thing too! PS: I’ve had Mountain Dairy on my must try list for months now! Your diner is a closer drive 🙂 Can’t wait to come back to try more! VJ and I have been wanting to try Hilltop since you came in and told us about it. I don’t think I will tackle either of the mountain burgers but the eggs benny looks delicious. Will definitely try some pie as well. I have driven past the place a billion times and never once thought to stop in. Good thing that you and Sherman are around “to explore strange new worlds… to seek out new life; new civilizations… to boldly go where no one has gone before!” Thanks for the heads up. what do you mean when you say it looks so “American” ? I live right around the corner-ish from the Hilltop and tried it for the first time yesterday. I did not find out about the Everest until I was on my way out…I will definitely be returning and possibly trying to get my pic on the wall. Shameless self promotion yet right on topic. IMHO I think this would be harder to finish solo than the Everest. Then again I may be biased, haha. @jodi – by that I mean it doesn’t look Canadian lol. We don’t have many places that look like this and it just reminded me of diners in the South that they use in Hollywood movie sets. @Jason – Awesome! I hope you liked it! Thanks for sharing your link! If anyone’s ever in Bellingham and have not tried it yet may I suggest the Little Cheerful. Great food, great bennys and they too have a monster-esque burger aptly named the myocardial infarction burger (which I may have ordered and finished,lol). Ha, I must have drove/walked by Little Cheerful many times yet never dropped in. Thx Jason ! That’s funny, all but Avenue Bread are already on my list of places to try…now I have one more to add to that list, thanks. FWIW, Skylark ain’t a foodie destination, we just go there for their family-friendliness. Although years ago (pre-parenting), we did enjoy their jazz nights which, happily, are still happening. Tempted to try the myocardial infarction burger, but looking at the menu my heart is palpitating from fear ! 2,500 calories, 100g fat ….. whew ! @Jason @LR – you guys are gluttonous!! Am I calling the kettle black? 😉 Thanks for the tips and recs! Love the sharing! It’s caring… but in this case the caring might result in a heart attack. Well I did it today, I had the Mountain Burger. I must say the Myocardial Infarction burger in Bellingham was bigger, badder and about $4.oo less. The Mountain WAS good though, but definitely not a $17.00 burger. I guess I’ll have to tackle the Everest next. @Jason – Welcome to the team!! Well almost. You should have just done the Everest if you were already doing the Mountain! I haven’t tried the Myocardial Infarction Burger… but I take your word for it! Hilltop buys their pies from Krause Berry Farms who, in fact, make their pies from their own strawberries – they’re grown about 1o minutes away from the cafe! Definitely not Californian! @Cathy – oh I’ve tried Krauseberry too… the strawberry still tasted quite tart for being local though. maybe it was just execution. A BC Spot Prawn party on the beach on Gusto TV! It all started a couple months ago when Gusto TV asked me to host an episode for “The Great Canadian Food Show”. The six episode series features six different ingredients across Canada, following them from harvest to someone’s plate… and I’m happy to say that plate ended up being mine!